Click on a question to link to the answer below. 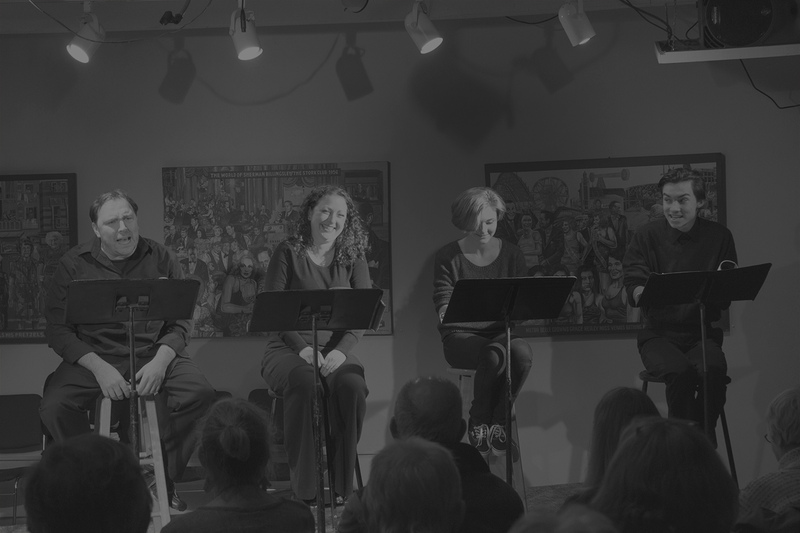 Readers Theatre is a performance format for actors and audiences whose passions for theatre and literature intersect. It accommodates all forms of literature and celebrates the finest that has been written. It is a performance style where the word, and all concomitant ideas, purpose, and realizations, become the focus. 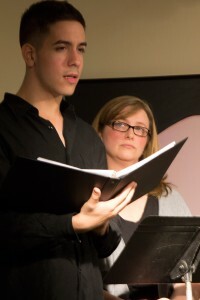 According to Julia Chernova in Introduction to Readers Theatre, “The most prominent element (of Readers Theatre) is the physical presence of the text on stage….The audience is constantly reminded that the text is the primary source for the performance.” Production elements (sets, props, costumes, lighting, etc.) are kept to a minimum to further focus attention on the spoken word. Are MMSC’s performances always in New Paltz? At present MMSC theater and arts performances are held primarily at Woodland Pond at New Paltz. Performances are also held in venues outside of New Paltz, including Woodstock, Poughkeepsie, Rhinebeck, Kingston and Accord. Performance venues do change from time to time. Each show’s information page will always include the most current venue information. Click on a show title on our Performances page to get the information you need. How do I get to New Paltz? Where do I park? Is there someplace to eat nearby? The answers to all of these questions and many other helpful links appear on our individual performance pages. Are special ticket discounts available? In general there are no discounts available. However from time to time special money savings packages become available. Our Ticket Info page will always include information on any special discounts. Are your programs suitable for children? MMSC productions contain a diverse selection of literary material. While some are chosen specifically for younger audiences, most are more suited to adult tastes. Rest assured we will always note when a program is especially suitable for our younger listeners. We urge parents of young children to respect our artists and audiences. The MMSC Box Office is generally open Monday-Friday, 10 am – 5 pm. For performances, the Box Offices is open half an hour prior to show time. Reserved seats not claimed fifteen minutes prior to show time may be sold. Does the Box Office accept MasterCard or Visa? We accept cash and checks. Performance tickets are non-refundable. Articles lost during a performance will be turned into the box office. Please call MMSC’s administrative offices (845-380-0155) to inquire. Can I receive an emergency call during a performance? Many of MMSC’s performance venues do not allow access to a public phone. As a courtesy to other members of the audience, MMSC requests that all beepers and cellular phones be silenced while you are in the performance venue. What is MMSC’s smoking policy? Smoking is prohibited in MMSC’s performance venues . Outside areas are available at both St. Andrew’s and Unison Arts and Learning Center for use by our smoking patrons. MMSC reserves the right to seat latecomers at its discretion. Can I take pictures or record the show? Taking pictures and/or using tape recorders is strictly prohibited. 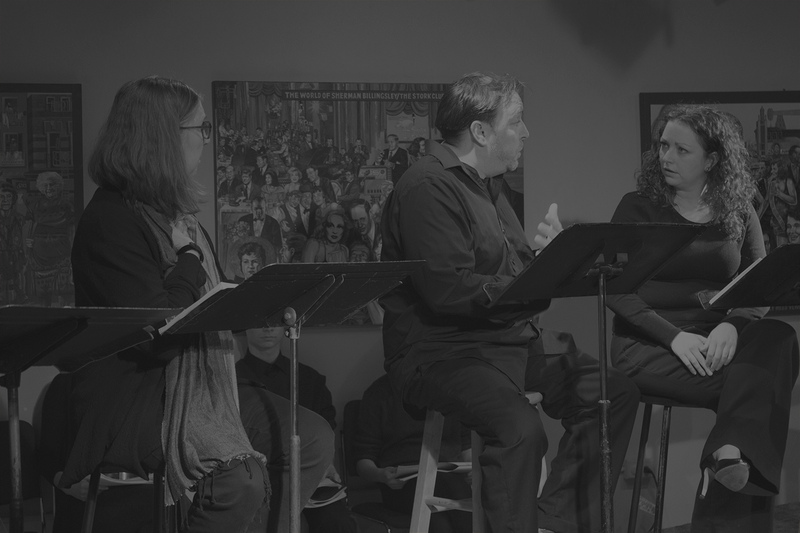 If you are interested in getting involved with MMSC as a reader, give us a call (845-380-0155) or drop us an email (info@mmstageco.com) and let us know to reach you. Absolutely! Click here for a form that you can download and fax or mail to us with your payment. What are the venues’ accessibility for persons with disabilities? Unison Arts & Learning Center is wheelchair-accessible (the parking lot is gravel, though). Performances at most of our “host” venues, County Players at the Falls Theatre, SUNY Orange, Mohonk Mountain House, etc., are accessible. Are the MMSC Readers available for private events? Certainly! Call or e-mail us with your request and we will promptly respond. Robert G. Miller, MMSC’s Producing Director, spent more than twenty years as a professional actor, director and administrator in regional theaters. From 1980-1991, he was Artistic Director of the Asolo Touring Theater, in Sarasota, Florida. One of the largest Equity/TYA companies in the country, the Asolo performed each year for thousands of children throughout the East Coast. He moved to the New Paltz in 1991 and in 1994 created Mohonk Mountain Stage Company as a theater for young audiences, which performed at schools and in residencies at Brooklyn Academy of Music and the Kennedy Center for the Performing Arts. MMSC currently presents plays, fiction and poetry in the Readers Theater format. 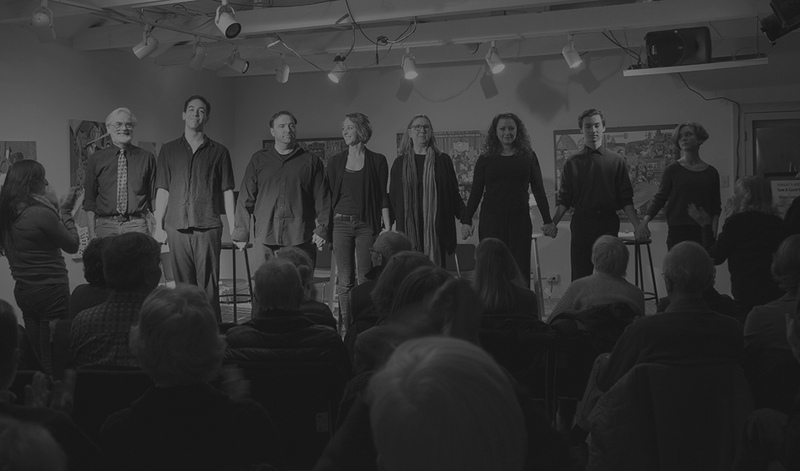 Recent presentations include Hudson Valley premieres of Art, Equivocation, Next Fall,The Laramie Project, Dinner With Friends, Sons of the Prophet and Copenhagen. He is recently retired as the Advisor Co-ordinator of the Communication and Media Department at the State University of New York at New Paltz, where he also taught.